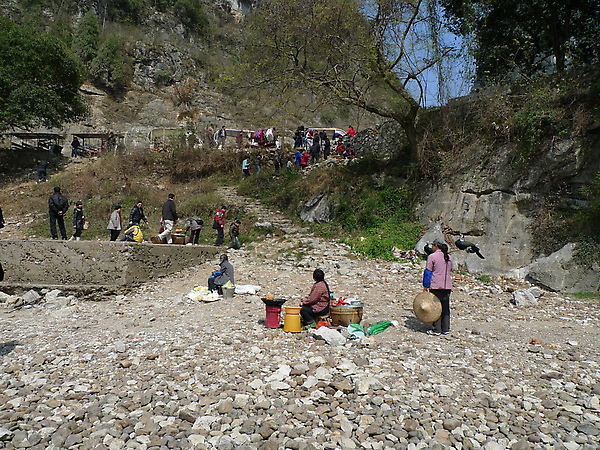 Now that everyone was ready and assembled (all two of us) we could start seeing some of the amazing countryside that litters China's Southwest. 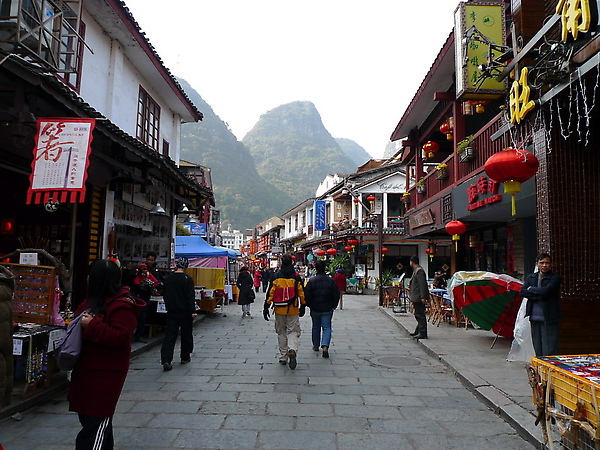 Our first destination was the world famous "Yangshuo." 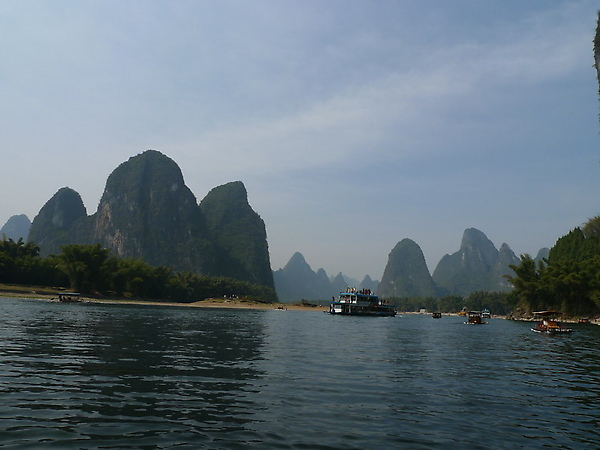 There's a poem in Chinese that most people know proclaiming that Guilin has the best landscapes under heaven, and that Yangshuo is the best in Guilin. 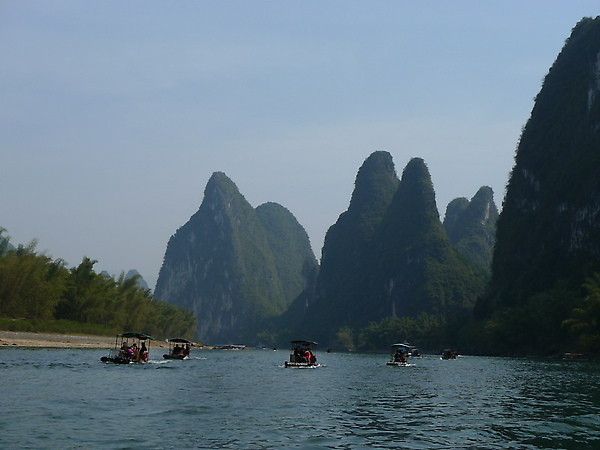 While obviously a boast, Yangshuo does indeed have a claim to the title of "best scenery in the world." 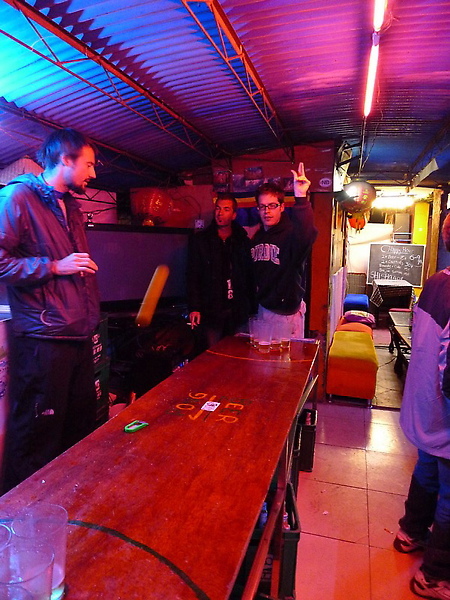 I would rank it in the same league as Ha Long Bay and the Langtang Valley. 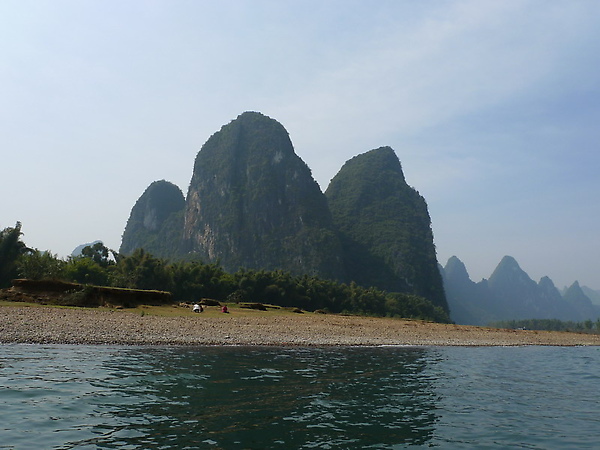 The sheer beauty of colossal karst peaks streaking up out of the flat plain is enough to take your breath away. 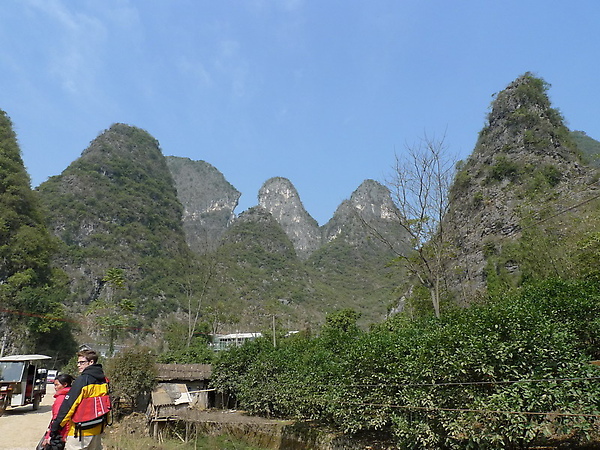 The bus ride to Yangshuo from Guilin was two hours long. 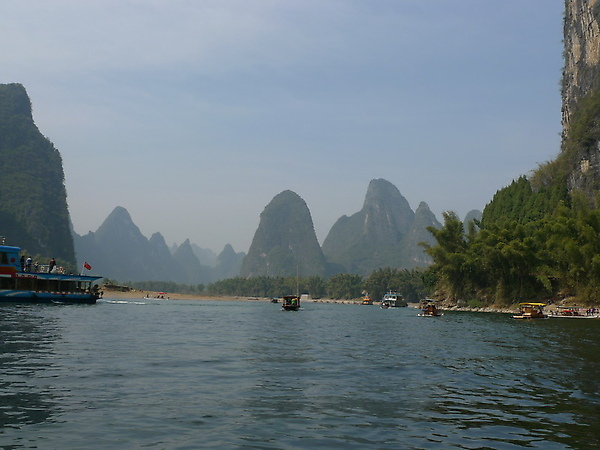 By the last half hour it became very clear that Yangshuo was one of those places where you only need to walk 100 meters to find the next breathtaking view. 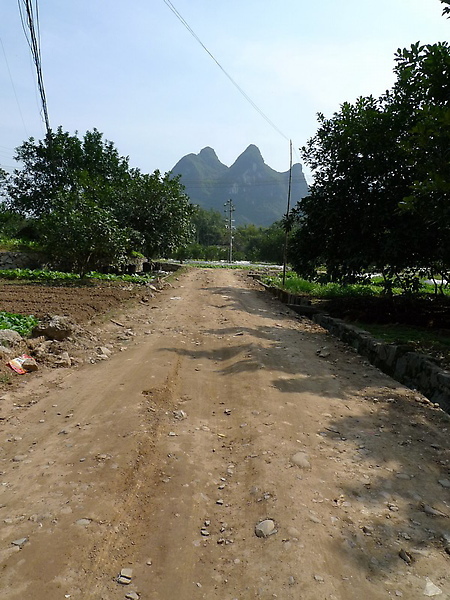 When arrived in Yangshuo I inadvertently took a wrong turn coming out of the bus station and caused us to walk quite a ways in the wrong direction. Becky, bless her heart, has all the patience in the world for me. 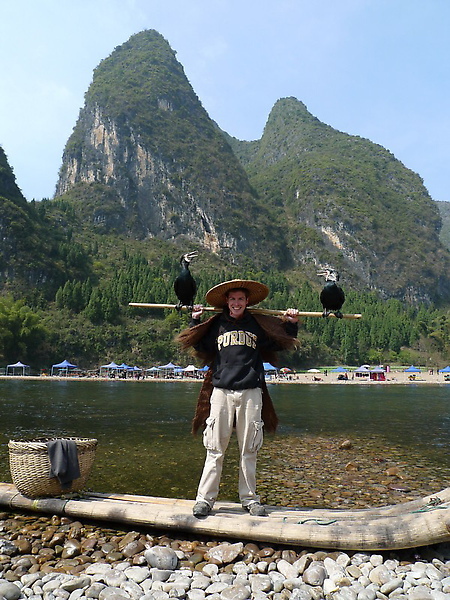 After finding our hostel we immediately booked two excursions: a bamboo boat ride on the Li River and a night time cormorant fishing exhibition. 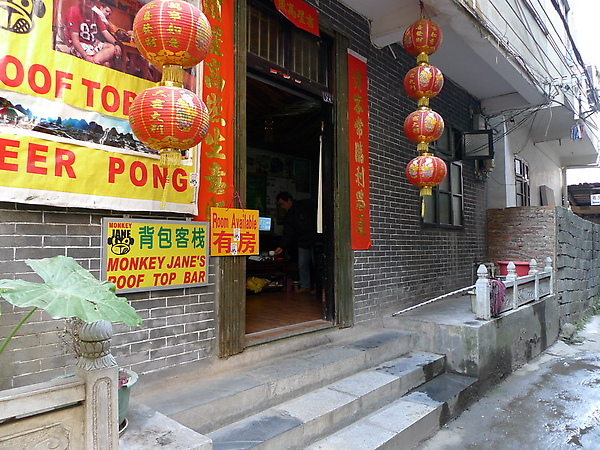 After that it was time to catch our bus to the small town of Ping Xing for our boat ride. 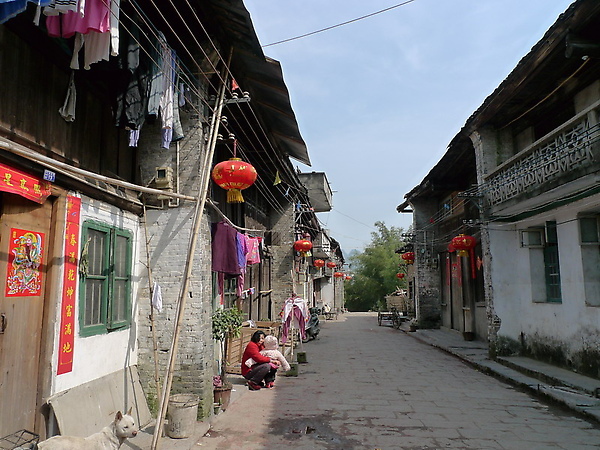 Ping Xing was a very interesting experience, the town itself is nothing more than a village snuggled up against the Li River. 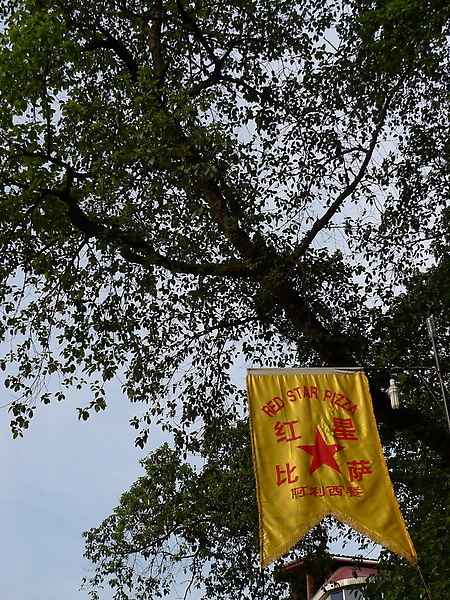 Don't make any mistake though, this is not the "real China" that everyone is convinced lurks in the hills. These were modern concrete structures and the roads were full of motorbikes. 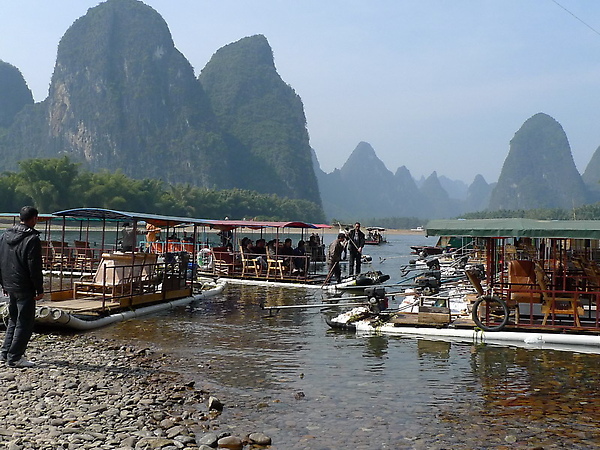 We paid a reasonable fee to take a small tractor-coach-thing to the river. 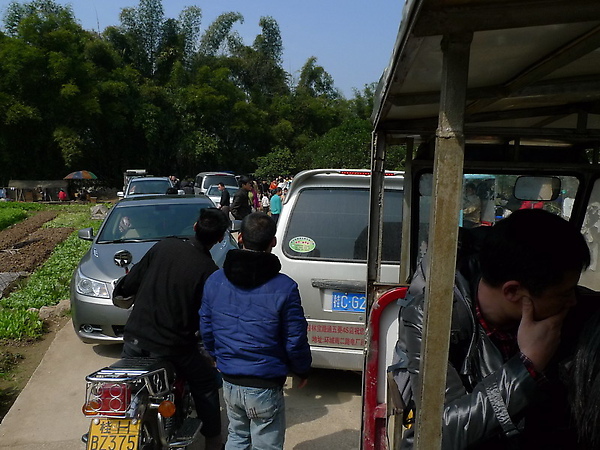 On our way there we encountered a traffic jam on a tiny road in the midst of the rice fields. 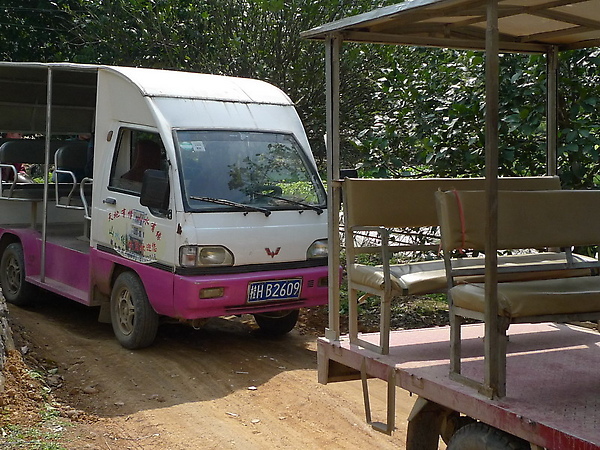 Our driver decided to take the small dirt road around to the beach where the bamboo boats were moored. Unfortunately for our driver, going on the small road involved going up a hill, something his tractor engine refused to do. About 75% of the way up the hill, his engine decided not to work anymore and we started sliding backwards. Our tractor slid backwards a few meters and smashed into the tractor behind us. We all had to disembark and listen to our 'chauffeur' casually remark 'it just couldn't make it up the hill' in response to the outraged driver behind him. We elected to walk the rest of the way and were treated to some really authentic farmhouses and fields along the dirt road. The beach was only a few hundred meters away so we were not overly tired from walking. 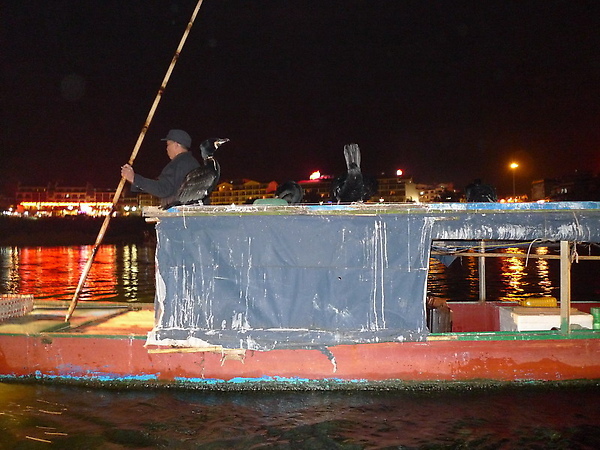 The bamboo boat was as authentic as a PVC pipe bamboo boat with an outboard motor can be. Luckily we had come in the off season and the river was not completely clogged with visitors. For the first few peaks we passed the driver gave us a description of what it was supposed to look like. I imagine he noticed we were uninterested in wasting our time squinting to see the 'batman head' or whatever it was, because after a few peaks he simply stopped talking. Becky has an abundance of pictures from this part of the trip. After taking the boat for about 45 minutes we arrived at a small island. We stopped to rest. Becky took photos. 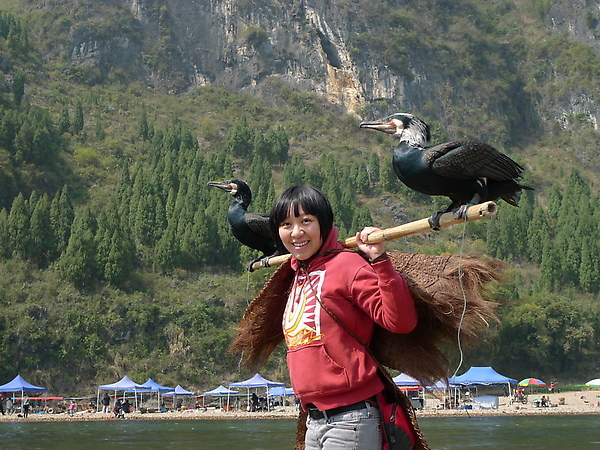 We paid a man 10 yuan to take a picture with his Cormorants and bought some mandarin oranges. Surprisingly these oranges were Becky's first ever mandarin oranges. I thought they were a staple in all of Asia, apparently not. After arriving back at the beach where we had set out, we started to walk back into town. 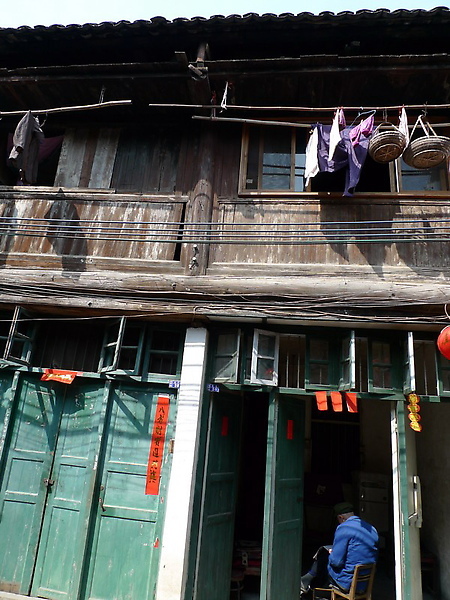 We stumbled upon the old part of town and wandered into its alleys to peruse the shops. 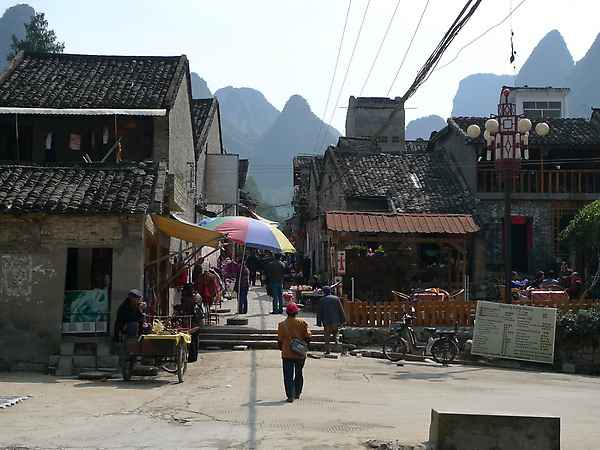 After looking at some local 'handicrafts' we headed back to bus stop and returned to Yangshuo. 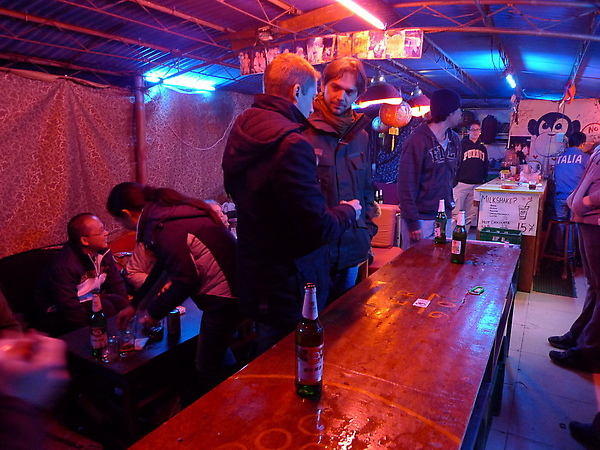 Upon returned we decided to try some of the 'famous' western food in Yangshuo. 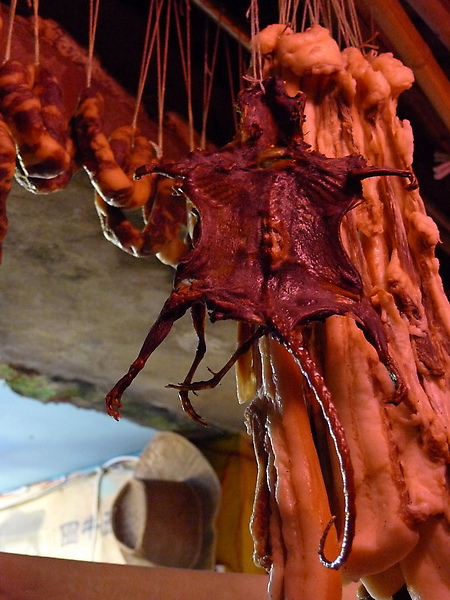 We headed to a place famous for its pizza. 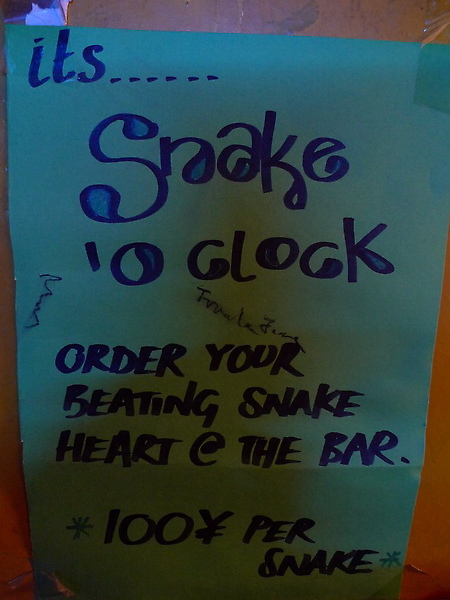 After looking at the menu we decided to stray from the guidebook and order something OTHER than pizza. 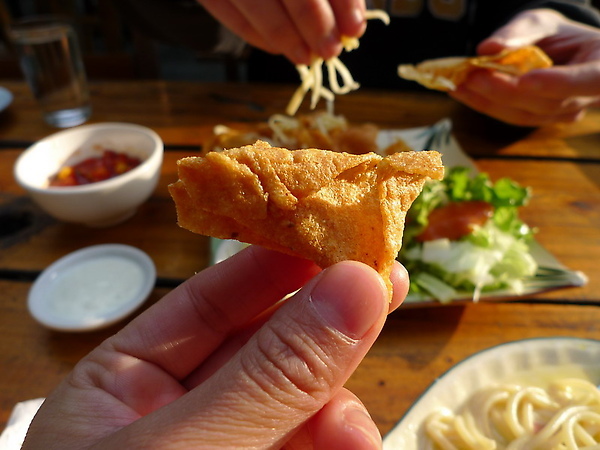 Our mistake became obvious when our 'nachos' arrived. 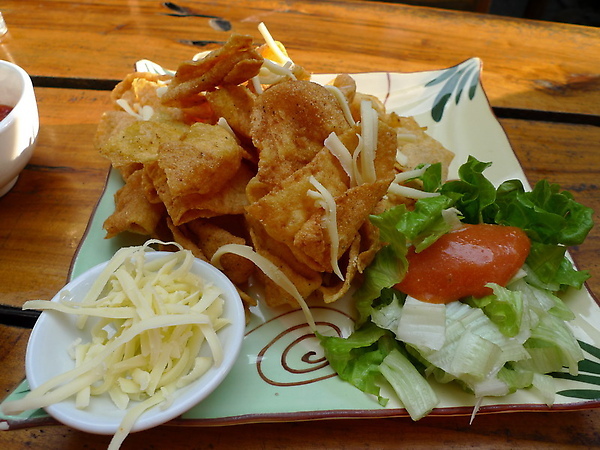 They were nothing more than chips (which had the consistency of those bugle snacks we had as kids) with cold grated cheese on top and yogurt instead of sour cream. Becky had ordered the Alfredo pasta, which was watery and full of ham cubes. I, on the other hand, struck pay dirt with my lasagna. Some of you may say "Brian I don't care what you ate." I must, however, remind Becky as much as possible that I won this time. 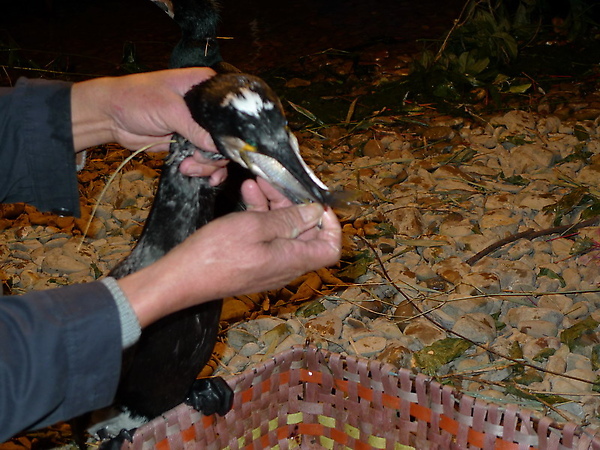 Our night time activity started with the cormorant fishing show. 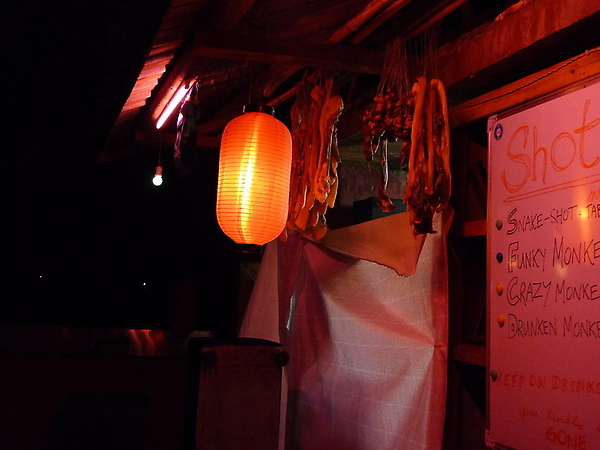 We were taken aboard a boat and set off into the river in the darkness. We were brought alongside another boat. 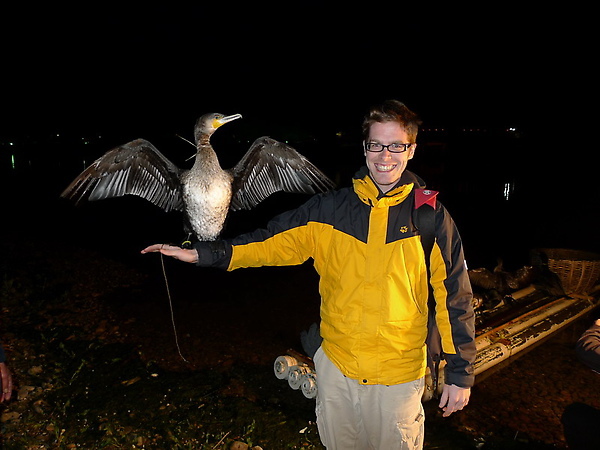 This second boat was crewed by two men, one driving and the other 'birding.' 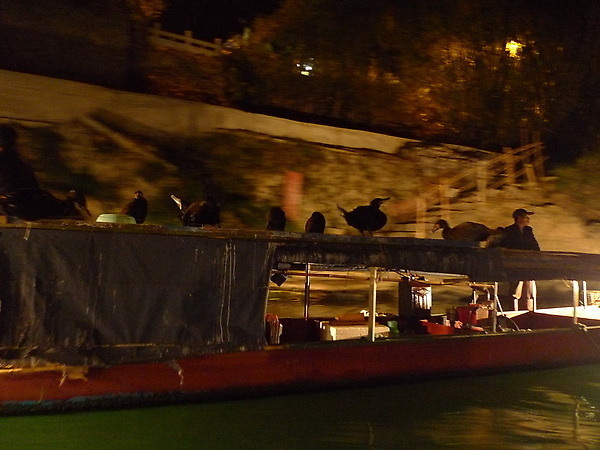 There were at least 10 cormorants standing on the boat and another 10 swimming in the water. 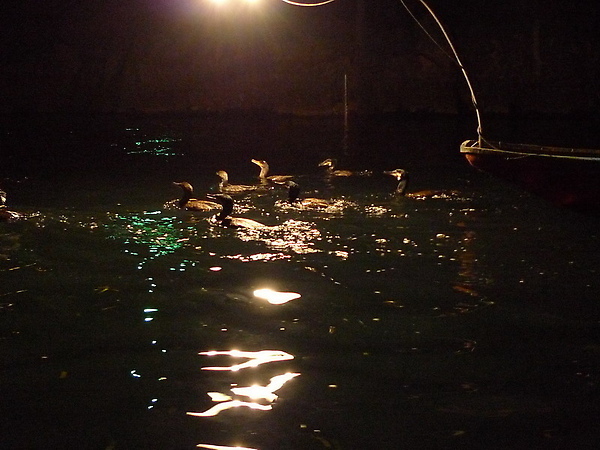 The birds would dive in and out in pursuit of tiny silver fish. 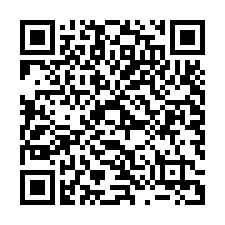 Their efficiency was not that spectacular. In the 20 minutes that we watched them they caught about 5 fish. We landed briefly on a sandy beach to see the birds up close; a great photo op. 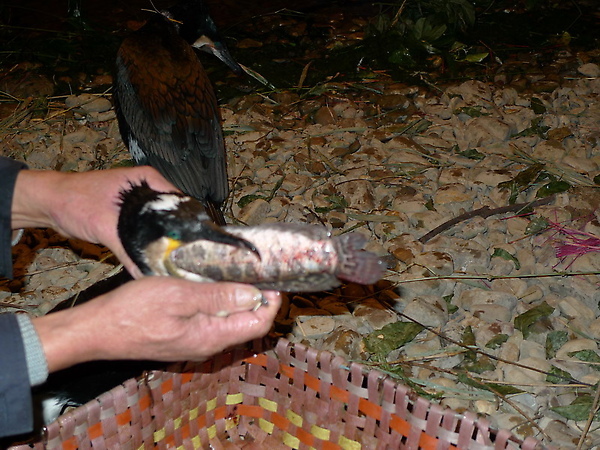 We also learned that the birds have a string tied around their throat so that they cannot swallow the fish. 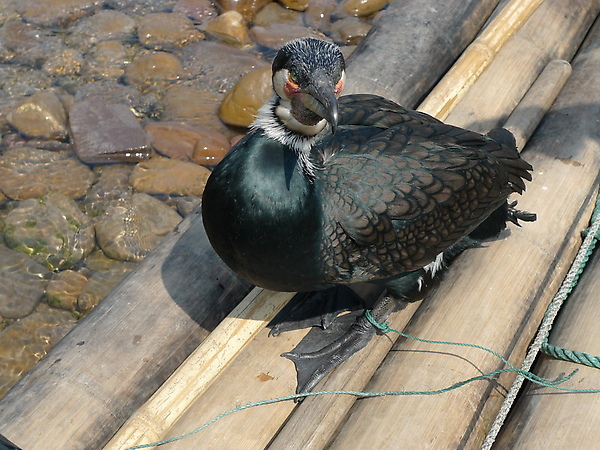 Instead the fish simply sits in their expandable throat until massaged out into a basket back aboard the boat. 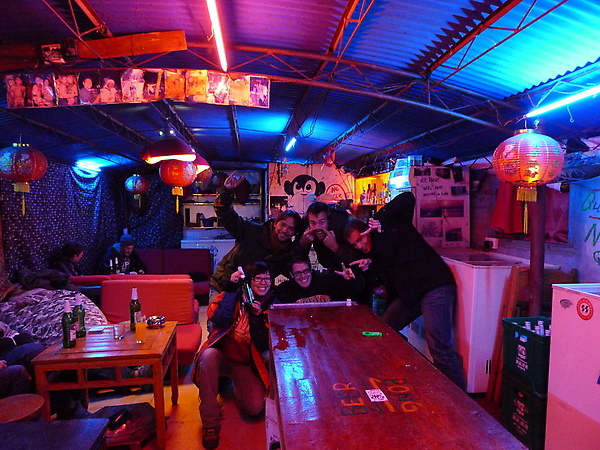 A little tipsy and in high spirits we bade our friends farewell and made plans to meet up at 10 the next morning for a bike ride.